Illuminated manuscript from Menologion of Basil II. Decius orders the walling in of the Seven Sleepers. From a 14th-century manuscript. In Christian and Muslim tradition, the Seven Sleepers (Arabic: اصحاب الکهف‎, translit. aṣḥāb al kahf, lit. 'People of the Cave') is the story of a group of youths who hid inside a cave outside the city of Ephesus around 250 AD to escape a religious persecution and emerged some 300 years later. The earliest version of this story comes from the Syrian bishop Jacob of Serugh (c. 450 – 521), which is itself derived from an earlier Greek source, now lost. An outline of this tale appears in Gregory of Tours (538–594), and in Paul the Deacon's (720–799) History of the Lombards. The best-known Western version of the story appears in Jacobus da Varagine's Golden Legend. 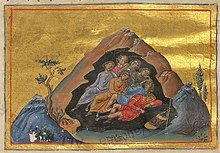 The Roman Martyrology mentions the Seven Sleepers of Ephesus under the date of 27 July (June according to Vatican II calendar). The Byzantine calendar commemorates them with feasts on 4 August and 22 October. The ninth-century Irish calendar Félire Óengusso commemorates the Seven Sleepers on 7 August. The story appears in the Qur'an (Surah Al-Kahf 9–26) and thus is important to Islam. The Islamic version includes mention of a dog, who accompanied the youths into the cave and appears to keep watch. In Islam, these youths are referred to as the People of the Cave. 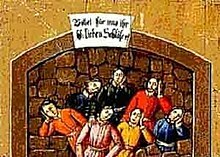 A 19th century German votive painting of the Seven Sleepers. The writing says Bittet für uns Ihr hl. sieben Schläfer (Pray for us, Holy Seven Sleepers). The story says that during the persecutions by the Roman emperor Decius, around 250 AD, seven young men were accused of following Christianity. They were given some time to recant their faith, but they refused to bow to Roman idols. Instead they chose to give their worldly goods to the poor and retire to a mountain cave to pray, where they fell asleep. The Emperor, seeing that their attitude towards paganism had not improved, ordered the mouth of the cave to be sealed. Decius died in 251, and many years passed during which Christianity went from being persecuted to being the state religion of the Roman Empire. At some later time – usually given as during the reign of Theodosius II (408–450) – in 447 A.D. when heated discussions were taking place between various schools of Christianity about the resurrection of body in the day of judgement and life after death, a landowner decided to open up the sealed mouth of the cave, thinking to use it as a cattle pen. He opened it and found the sleepers inside. They awoke, imagining that they had slept but one day, and sent one of their number to Ephesus to buy food, with instructions to be careful lest the pagans recognize and seize him. Upon arriving in the city, this person was astounded to find buildings with crosses attached; the townspeople for their part were astounded to find a man trying to spend old coins from the reign of Decius. The bishop was summoned to interview the sleepers; they told him their miracle story, and died praising God. The various lives of the Seven Sleepers in Greek are listed and in other non-Latin languages at BHO . As the earliest versions of the legend spread from Ephesus, an early Christian catacomb came to be associated with it, attracting scores of pilgrims. On the slopes of Mount Pion (Mount Coelian) near Ephesus (near modern Selçuk in Turkey), the grotto of the Seven Sleepers with ruins of the religious site built over it was excavated in 1927–1928. The excavation brought to light several hundred graves dated to the 5th and 6th centuries. Inscriptions dedicated to the Seven Sleepers were found on the walls and in the graves. This grotto is still shown to tourists. The story appeared in several Syriac sources before Gregory's lifetime. It was retold by Symeon the Metaphrast. 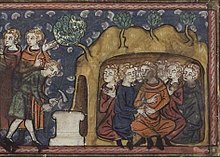 The Seven Sleepers form the subject of a homily in verse by the Edessan poet-theologian Jacob of Serugh (died 521), which was published in the Acta Sanctorum. Another sixth-century version, in a Syrian manuscript in the British Museum (Cat. Syr. Mss, p. 1090), gives eight sleepers. The flag of Kelantan in the 19th century, located in present-day Malaysia. The historical flag incorporated elements from the Islamic interpretation of the story. In the surah, the dog is believed to act as a guardian, looking out for the believers until they are awoken. The story of the Companions of the Cave is referred to in Surah 18 (verses 9-26). According to Muslim scholars, God revealed these verses because the people of Mecca challenged Muhammad with questions that were passed on to them from the Jews of Medina in an effort to test his authenticity. They asked him about young men who disappeared in the past, about a man who travelled the earth from east to west, and about the soul. The story parallels the Christian version, recounting the story of a group of young believers who resisted the pressure to worship others beside God, and took refuge in a cave, following which they fell asleep for a long time. When they woke up they thought that they had slept for only a day or so, and they sent one of them back to the city to buy food. His use of old silver coins revealed the presence of these youths to the town. Soon after their discovery, the People of the Cave (as the Qur'an calls them) died and the people of their town buried them in the cave and built a place of worship there. Muslims firmly believe in the story as it is mentioned in the Qur'an; however the location of the cave is not mentioned. Most allege that it is in Ephesus, Turkey; others cite a place filled with carved sarcophagi from the late Roman empire. they entered the cave at the time of Decius (250 AD) and they woke up at the time of Theodosius II (408–450 AD), but neither of these dates can be reconciled with the Qur'an's account of sleeping 300 or 309 years. Islamic scholars, however, assert that the 300 or 309 years mentioned in the Qur'an refers to periods of time alleged by those telling the tale, rather than a statement made by God as to how long they were actually in the cave. In Welsh, a late riser may be referred to as a saith cysgadur—seven sleeper—as in the 1885 novel Rhys Lewis by Daniel Owen, where the protagonist is referred to as such in chapter 37, p. 294 (Hughes a'i Fab, Caerdydd, 1948). This has the double meaning of one who wakes at seven—well into the working day in a Welsh rural setting. In some countries people say: "May you sleep like the people of Ephesus". Fortescue, Adrian (1913). "The Seven Sleepers of Ephesus". In Herbermann, Charles (ed.). Catholic Encyclopedia. New York: Robert Appleton Company. Retrieved 14 March 2015. ^ Pieter W. van der Horst (February 2011). Pious Long-Sleepers in Greek, Jewish, and Christian Antiquity (pdf). The Thirteenth International Orion Symposium: Tradition, Transmission, and Transformation: From Second Temple Literature through Judaism and Christianity in Late Antiquity. Jerusalem, Israel. pp. 14–5. ^ Liuzza, R. M. (2016). "The Future is a Foreign Country: The Legend of the Seven Sleepers and the Anglo–Saxon Sense of the Past". In Kears, Carl; Paz, James (eds.). Medieval Science Fiction. King's College London, Centre for Late Antique & Medieval Studies. p. 66. ISBN 978-0-9539838-8-9. ^ Stokes, Whitley (1905). The Martyrology of Oengus the Culdee: Félire Óengusso Céli Dé. Harrison and Sons. p. 4. ^ Peeters, P.; Société de Bollandistes (25 October 2018). "Bibliotheca hagiographica orientalis". Bruxellis, apud editores [Beyrouth (Syrie) Imprimerie catholique] – via Internet Archive. ^ "The Seven Sleepers". The Golden Legend. Archived from the original on 6 January 2003. It is in doubt of that which is said that they slept three hundred and sixty-two years, for they were raised the year of our Lord four hundred and seventy-eight, and Decius reigned but one year and three months, and that was in the year of our Lord two hundred and seventy, and so they slept but two hundred and eight years. ^ Jacobus (1899). "XV — The Seven Sleepers". In Madge, H.D. (ed.). Leaves from the Golden Legend. C.M. Watts (illustrator). pp. 174–175 – via Google Books. It is doubt of that which is said that they slept ccclxii. years. For they were raised the year of Our Lord IIIICLXXXIII. And Decius reigned but one year and three months and that was in the year of our Lord CC and LXX., and so they slept but iic. and viii. years. ^ Gassner, John, ed. (1987). Medieval and Tudor Drama. New York: Applause. p. 245. ISBN 9780936839844. ^ Samuel Clements (1976). Lawrence Teacher (ed.). The Unabridged Mark Twain. Philadelphia PA: Running Press. pp. 245–248. ^ Abdolah, Kader (2006) . Spijkerschrift [My Father's Notebook]. ^ "Sura 18: The Cave (Al-Kahf)". 3 June 2009. ^ "Surah 18. Al-Kahf". Quran in English. (18:25). Archived from the original on 5 May 2007. They remained in the Cave for three hundred years; and some others add nine more years.